A solenoid is a long coil made up of a numbers of turns of wire. The figure (a) illustrated the field pattern produced by a solenoid when current pass through it. The field lines in the solenoid are close to each other, showing that the magnetic field is stronger inside the solenoid. We can also see that the field lines are parallel inside the solenoid. This shows that the strength of the magnetic filed is about uniform inside the solenoid. 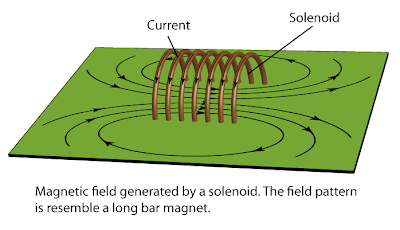 We can also see that the magnetic field of a solenoid resembles that of the long bar magnet, and it behaves as if it has a North Pole at one end and a South Pole at the other. 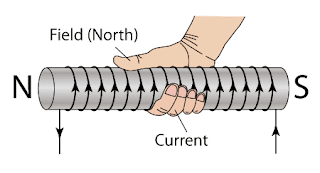 The pole of the magnetic field of a solenoid can be determined by the Right Hand Grip Rule. 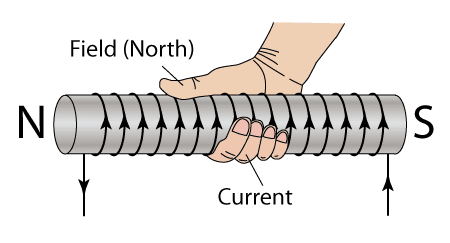 Imagine your right-hand gripping the coil of the solenoid such that your fingers point the same way as the current. Your thumb then points in the direction of the field. Since the magnetic field line is always coming out from the North Pole, therefore the thumb points towards the North Pole. 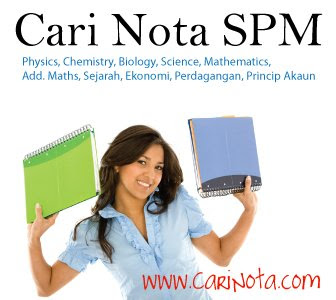 There is another method can be used to determine the pole of the magnetic field forms by the solenoid. 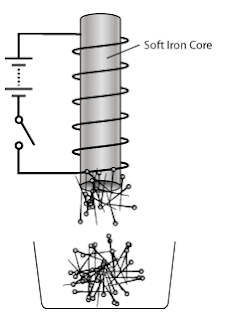 Try to visualise that you are viewing the solenoid from the 2 ends as illustrated in figure (c) below. The end will be a North pole if the current is flowing in the aNticlockwise, or a South pole if the current is flowing in the clockwiSe direction. Using a soft-iron core within the solenoid. D Replacing the battery with alternating current.